In 2001, Earbuds were introduced with the iPod. They were not particularly good at the gym or when walking. Recently Apple developed improved EarPods, but even with a better fit, they disappoint when you are physically active. The biggest problem is the dangly cord that gets caught on clothing, and its weight can pull the Earbuds or EarPods out of your ears. A few wireless earbuds are currently available but they either hang unsupported from your ear and fall out easily or they are cumbersome affairs with big batteries and stiff structures that rest behind your head. 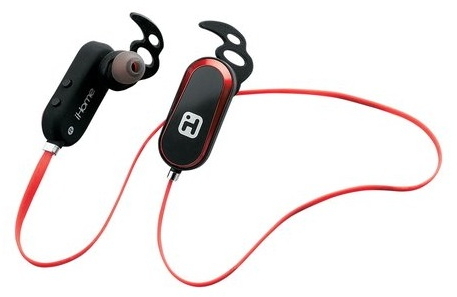 iHome has a better solution, the iHome Wireless Bluetooth headphones. These have the usual soft silicone tips that fit in your ear canal. 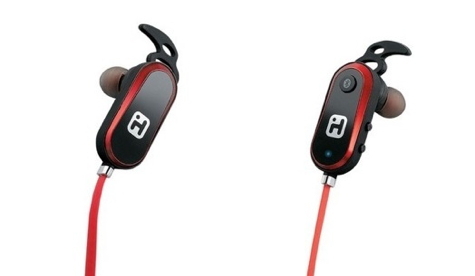 The big improvement is flexible in-ear fin supports that hold the earpieces firmly in place. Similar supports are available on some high-end earphones. These washable fins and soft silicone tips are supplied in three sizes each so that with a little experimentation, a secure fit can be achieved. In use, the iHome Wireless Bluetooth headphones, are quite comfortable. The flat red cable that runs behind your neck is soft, flexible, and doesn’t tangle. The devices that fit in each ear are not subtle; they look like a pair of those annoying Bluetooth phone answering devices that were popular a few years ago. They protrude from your ears prominently but they stay in place and the sound quality is good. They are perfect for the gym. Because they are sound isolating, I would not recommend in-car use since you will not be able to hear surrounding traffic sounds. All the action is in the unit that fits in your right ear. Under a sweat-proof cover there is a mini 8-pin USB socket where the included charging cable attaches. On the exterior of the earpiece there is a universal button that turns the headphones on and off and pairs Bluetooth with your iPhone (or other Bluetooth-compatible devices). It also is used for answering the phone. In addition, this button also is the Play/Pause control while the headphones are in operation. Volume Up/Down buttons are located on the front edge of the earpiece. On the back edge are audio track Forward/Back buttons. When your phone rings, the music fades and a press of the universal button lets you answer the call with a built-in mic. Pressing the same button ends the call and your music fades in again. Charging takes about two hours. Talk time is about eight hours per charge and about an hour less when listening to music. The stand-by time is about four days. The iHome Wireless Bluetooth headphones are not sleek, but they won’t fall out of your ears. The ability to answer your phone when you are listening to music, audiobooks, or podcasts is a convenient bonus feature.